Acana Singles Freeze Dried Treats Dog are 100% natural and freeze-dried snacks for your beloved dog. These treats are filled with delicious meat. So spoil your dog with this delicious treat! Do you want to spoil your beloved dog with a tasty and responsible treat? 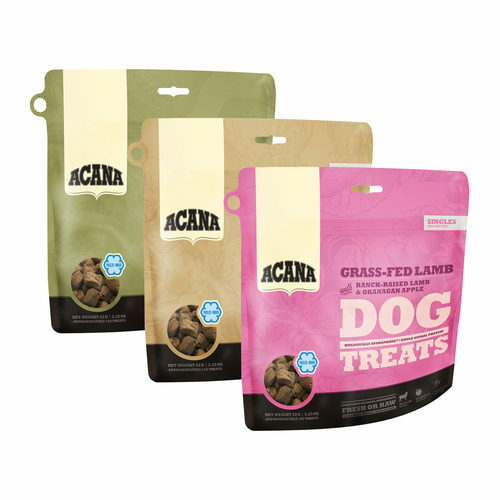 Acana Singles Freeze Dried Treats Dog are 100% natural and freeze-dried dog snacks that are rich in delicious meat. Because these snacks are freeze-dried, all the nutrients and flavours have been retained. This means your dog can optimally enjoy this treat. Grass-Fed Lamb: lamb liver (fresh or raw, 30%), lamb (fresh or raw, 30%), fresh Red Delicious apples (20%), lamb rumen (fresh or raw, 19.5%), chicory root, milk thistle, burdock root, lavender, marsh-mallow root. Free-Run Duck: fresh duck meat (45%), fresh duck liver (35%), fresh whole Bartlett Pear (19.5%), chicory root, milk thistle, burdock root, lavender, marsh-mallow root. Yorkshire Pork: fresh Herritage pork liver (50%), fresh Herritage pork meat (30%), fresh butternut squash (19.5%), chicory root, milk thistle, burdock root, lavender, marsh-mallow root. Have you used Acana Singles Freeze Dried Treats Dog before? Let us know what you think about this product.